While you are here – please check out my home page! Just recently, my husband and I decided to become members of Melbourne’s – National Gallery of Victoria (NGV). It was a reasonably small fee and membership would encourage us both, in the future, to take time out to view the many wonderful artworks of extraordinary living artists of today, and of those from the past as well. Over recent years, I have come to understand that art for therapy isn’t just about producing works of art for one’s self, that much can be gained therapeutically, by viewing the works of art of others. As a viewer of artwork, we are given an opportunity to step into the artist’s world which allows us to better understand their lives as artists, and as people. We sometimes discover where their sources of inspirations are derived and this in turn allows us to appreciate their dedication to their craft, their workmanship; their mastery; and their pure genius! 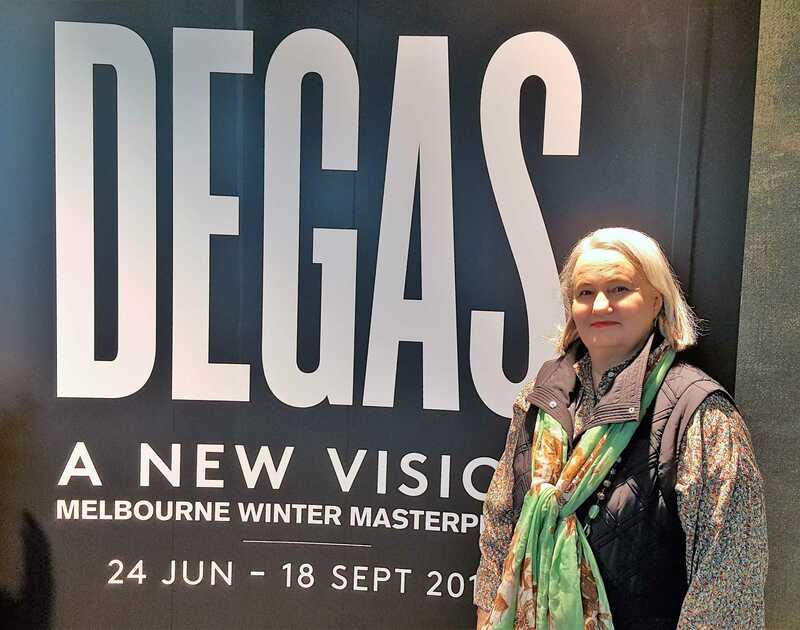 So it was on one of Melbourne’s winter, rainy days that we decided to venture into the city to have a look at the National Gallery of Victoria’s – Melbourne Winter Masterpieces exhibition featuring “DEGAS: A NEW VISION“. There would have been literally 1000’s of people there at the exhibition during the time-frame we were in attendance ourselves; and due to being the school holidays there where many mums, dads, grandparents whom had taken on the brave task of bringing their children into see this amazing Edgar Degas Exhibition. It was also pension’s day, so there was a sea of the elderly and that being us as well, making their way around very crowed gallery rooms. It was clear from this show of people, that the viewing of art, and in particular an exhibition such as this “DEGAS: A NEW VISION” was being appreciated by many generations of people, which in turn demonstrates, for me at least, that no matter our nationality, our age, our background, our fortune or misfortune, art seeks our attention and maintains our ongoing fascination which can improve our sense of well-being. A SELECTION OF GALLERY SCENE PHOTOS I TOOK ON THE DAY! Please click on the images below, which will take you to a slide show, where you can find details for most of the artworks. 20 of 20 ‘DEGAS – A NEW VISION’ Exhibition NGV July 2016 – Scene Photos taken by Karen Robinson NB All images are protected copyright – Group of dancers (red shirts) 1895-1900 pastel 77.0 x 58.0 cm Lent by Glasgow Life (Glasgow Museums) on behalf of Glasgow City Council: from the Burrell Collection with the approval of the Burrell Trustees (NGV 2016). 13 of 20 ‘DEGAS – A NEW VISION’ Exhibition NGV July 2016 – Scene Photos taken by Karen Robinson NB All images are protected copyright Dancer with bouquets c. 1895-1900 oil on canvas 180.3 x 152.4cm Chrysler Museum of Art, Norfolk, Virgina Gift of Walter P. Chrysler. Jr. in memory of Della Viola Forker Chrysler (NGV 2016). 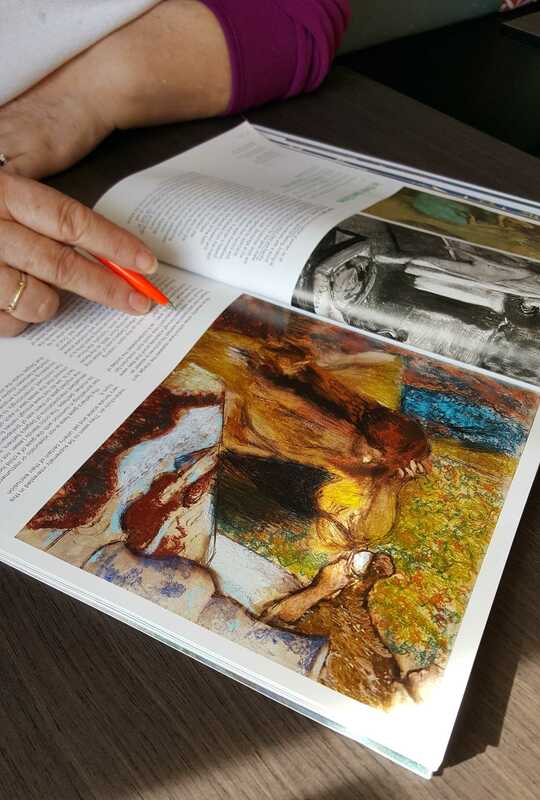 Please find here below a PDF of Degas Artwork labels as provided by the National Gallery of Victoria for those whom may wish to know more about each of his works as exhibited at this particular exhibition. Edgar Degas was born in Paris in 1834 to an upper middle-class family. He abandoned his studies at university to devote himself to painting and become a celebrated French Impressionist (NGV 2016). Life in Paris provided Edgar with a great source of inspiration – from scenes of work and industry to ballet and the theatre, race courses and boudoirs (NGV 2016). His work over fifty years embraced painting, drawing, printmaking, monotypes, sculpture and photography – impacting greatly on modern and contemporary art (NGV 2016). Below here is a YouTube that very well introduces the life of Edgar Degas. It’s lengthy but worthy of a watch for those whom are particularly interested in his life and his artwork. The exhibition of Edgar Degas’s consisted of over 200 works from dozens of collections worldwide and make up of paintings, drawings, printmaking, monotypes, sculptures and photography (NGV 2016). Degas’s exhibition was expansive and really needed days of viewing rather than the little time that my hubby and I had undertaken. 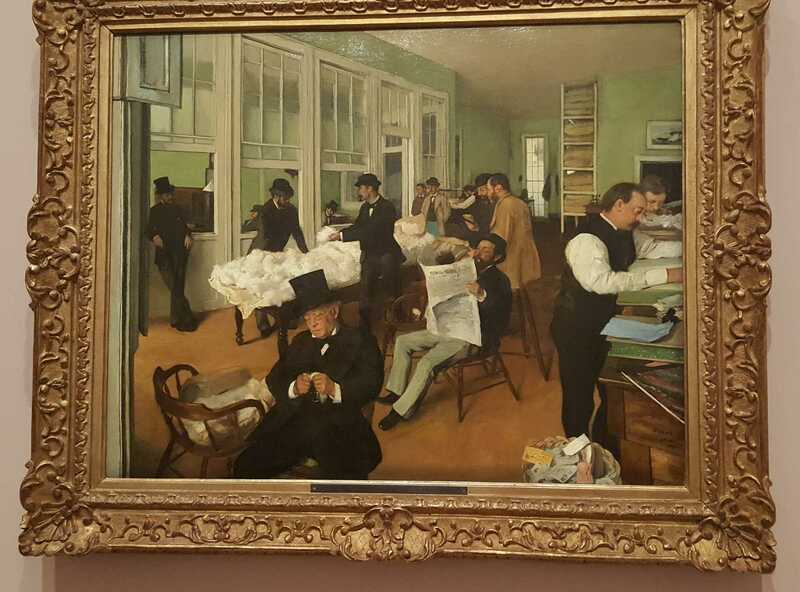 I felt very privilege to have had the opportunity to see Degas’s works up close and not just in pictures or within documentaries – it was a wonderful experience. 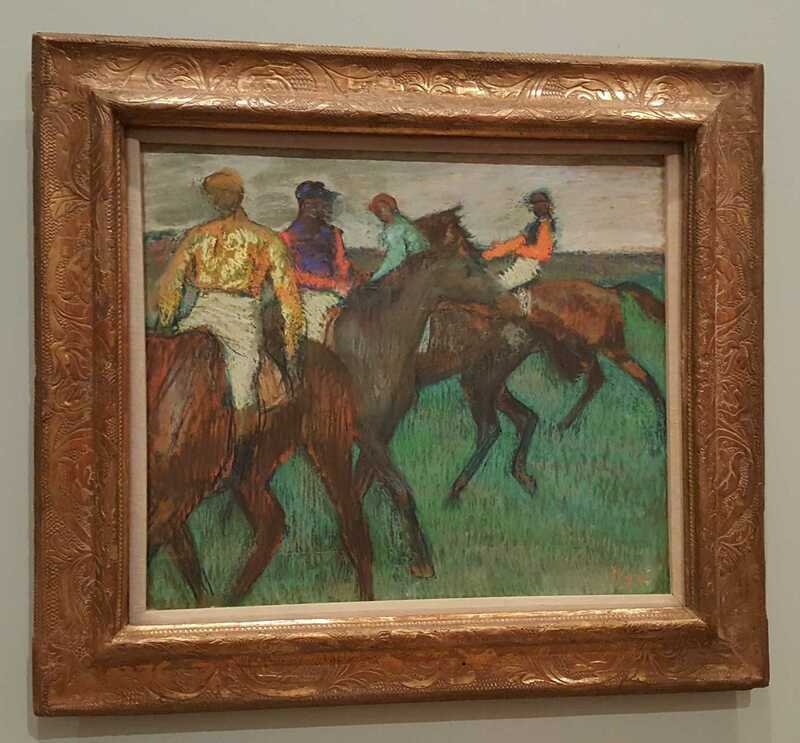 There was so much to be enjoyed at Edgar Degas NGV’s Exhibition that I can only list a few of my favourites below. 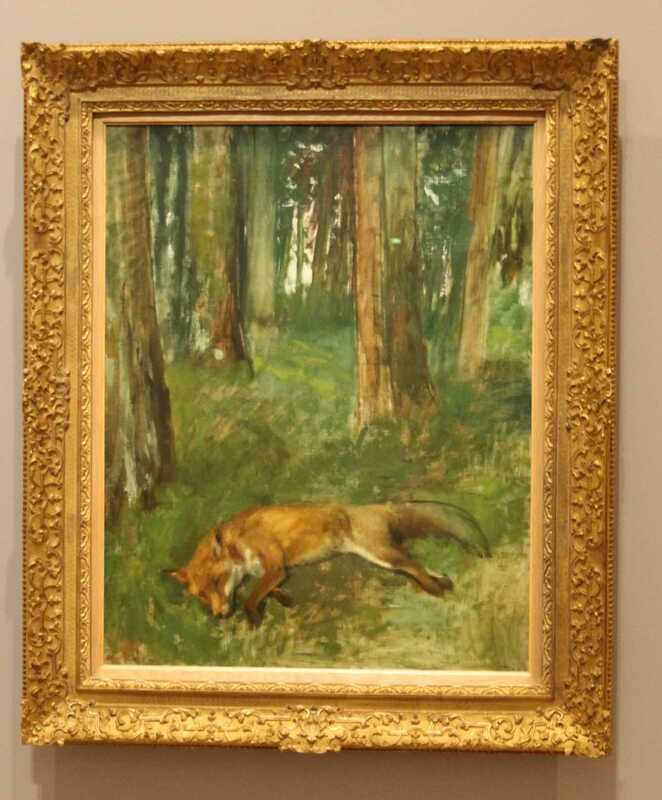 I particular enjoyed viewing ‘A cotton office in New Orleans’ where it shows a group of men at work, its colouring and the angle of the view of the painting captures so much detailing of the men engaging in their daily tasks; ‘Dead fox in the undergrowth’ where the fox just seemed to be laid out in a resting position but is actually dead, there seemed to be something very sad about this image; and there were many portraits that I found engaging and in particular the ‘Edmondo and Therese Morbilli’, probably because of the story that they had experienced a loss of a child and with this knowledge, you could see the grief on their faces – a sense of sadness and despair. Edgar Degas’s paintings of the dancers/ballerinas which he is best known for being that they are intimate and personal – I loved, the colour, the movement, the natural poses of the dancers/ballerinas just going about their daily routines. 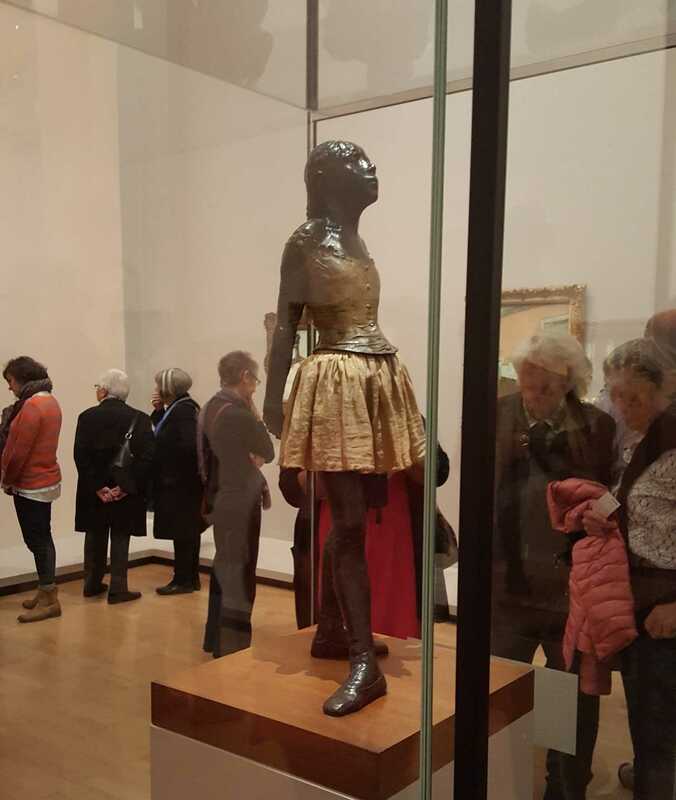 Here please find a very short YouTube about Degas’s ‘The little fourteen-year-old dancer’ 1879-81 – Cast 1922-37 bronze with cotton skirt and satin ribbon 99.0 x 35.2 x 24.5cm. 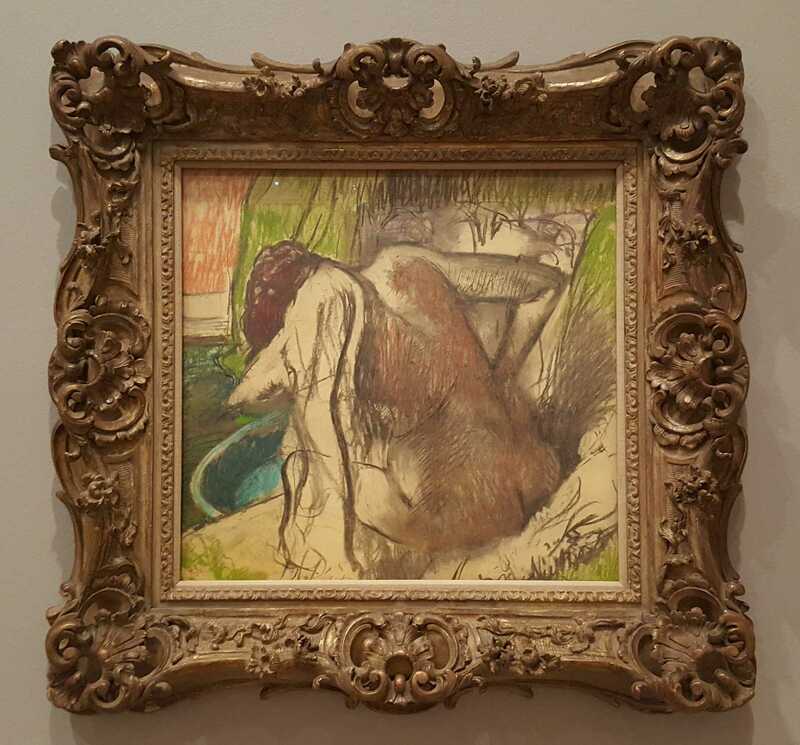 We came away from Edgar Degas’s National Gallery of Victoria’s Exhibition knowing we had viewed an extraordinary exhibition, a once in a lifetime opportunity to see and appreciate the artwork of one amazing artist. Art for therapy at its best for sure! This entry was posted in Art Exhibitions of other Artists, My art, Other Artists and tagged Art as Therapy, Art Exhibition, Artist Blog, Degas Portraits, Edgar Degas, Edgar Degas Dancers, Edgar Degas Little Dancer in Bronze, ido art karen robinson, Karen Robinson, National Gallery of Victoria, National Gallery of Victoria - Degas: A New Vision by idoartkarenrobinson. Bookmark the permalink.